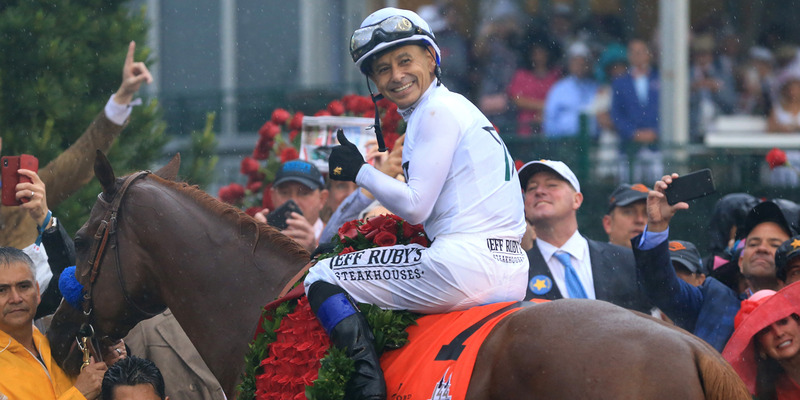 Sean M. Haffey/Getty ImagesAfter dominant performances at the Kentucky Derby and Preakness Stakes, Justify is the odds-on favourite to beat the field one more time at the Belmont Stakes and become the 13th horse in history to complete the Triple Crown. The race for the Triple Crown returns this weekend with the 150th running of the Belmont Stakes. On Tuesday, post positions were drawn, with Justify racing out of the first gate and set as the heavy favourite at 4/5. Justify will face some tough competition running on fresh legs, but has some advantages working in his favour that give him an edge to become just the 13th horse to complete the Triple Crown. The 150th running of the Belmont Stakes will have history on the line as Justify attempts to become just the 13th horse in history to win the Triple Crown. So far, Justify has looked unstoppable. He overcame the “Curse of Apollo” to win the Kentucky Derby in dominant fashion and take home the roses. He followed that up with a stellar race in the worst possible conditions at the Preakness Stakes and now stands just one win away from Triple Crown history. To do so, he’ll have to best yet another talented field of horses, including some running on fresh legs that could spoil the party many racing fans are planning for the big day. While Justify is the heavy favourite with 4/5 odds, according to the opening line, the horse given the second-best chance at winning the race is Hofburg, whose owner, Juddmonte Farms, has pulled off a Belmont upset in the past. Back in 2003, Juddmonte’s Empire Maker took home the race, spoiling the Triple Crown aspirations of Funny Cide, who finished in third. Notably, Hofburg’s team decided to skip the Preakness Stakes to run extra length off the Belmont on fresh legs – just as Empire Maker did in his 2003 upset. Justify’s road to history may be daunting, but there are some factors on his side as well. Trainer Bob Baffert knows how to handle the spotlight, having led American Pharoah to Triple Crown glory back in 2015. Preparing for the longest race of the Triple Crown after running two of the best races of a horse’s career is no easy task, but if anyone is up to it, it’s Baffert. Additionally, Justify is racing out of post no. 1, which has produced a whopping 23 winners at the Belmont Stakes, more than any other post in the history of the race. Of those 23, five were Triple Crown winners. Horse racing fans had to wait almost 40 years between Triple Crown winners until Baffert, and American Pharoah completed the feat. Now, just three years later, Justify has the chance to thrill the world again.